XOP Networks, Inc., a developer of advanced Audio Conference Bridges, announced availability of WebRTC based access on its Digital Collaboration Bridge and Universal Service Node Audio Conference Bridge platforms. WebRTC technology is making rapid inroads in the telephony industry. It adds Real Time Communications capability to browsers. Currently, it is available on Google Chrome and Fire Fox browsers. 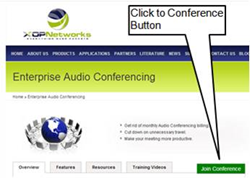 An end user using WebRTC enabled browser can now join an ongoing audio conference on XOP Bridge simply by clicking on a button on a web page – no need to dial into the bridge. “Several of our customers have overseas operations. With WebRTC capability overseas staff members can join a conference hosted on their on-premises bridge simply by going to a web portal and pressing the ‘join conference’ button. The audio path to the conference bridge is immediately established over the Internet without requiring a long distance call. Besides the addition of WebRTC software upgrade package, our solution does not require any other networking changes,” said Doug Jacob’s, XOP Networks’ VP of Sales. “We constantly strive to provide most innovative conferencing products to our enterprise and Telco customers worldwide. Introduction of WebRTC technology on our product line is just another example of that,” said Sudhir Gupta, XOP Networks’ CEO.